The new Audi RS6 Avant might technically be classed as an Estate car but you’ll be hard pressed to find an Estate that’s ever gone as fast as this before. It’s expensive to buy and run but it could be the most fun you and your family will ever have on the road. It can also be just as easily classed as a supercar. For some, it will be an irresistible proposition: 0-62 can be done away within 3.7 seconds while the boot measures 565-litres with all the seats up. Sounds too good to be true? OSV takes a closer look at what it’s all about with our Audi RS6 Avant review. Even sports cars will have difficulty keeping up with the RS6 Avant when it’s in full flow. Its sole engine develops 552bhp in standard guise and can get you from rest to 62mph in 3.9 seconds. If you pay extra for the Performance Pack, you can change those numbers to 597bhp and 3.7 seconds. However, Audi’s are not exactly known for having the most involving driving experience, and that’s the case again here. So while there’s no doubting this car’s chops, it won’t excite you in the same way that, say, a BMW can. In fact, its driving experience can even be described as sterile. That sounds like a crazy thing to say when there’s an engine here that develops almost 600bhp, but the RS6 is too clinical to be engaging. It’s competent and that will do for some buyers – but not all. And although there’s a considerable amount of power on offer, it’s not easy to make the most of it. The Quattro four-wheel-drive system provides the car with lots of grip and body lean is kept at a minimum. On the other hand, the steering lacks feel, and this can be a massive problem for a car that has so much power. A lot of the time, taking corners at speed will turn into a guessing game. The question becomes: How are your nerves? Using the Drive Select system to switch to the sportiest mode will sharpen the steering somewhat while distributing power more effectively, but the steering then starts to feel too artificial and too heavy. The brakes are mighty powerful, though, but if you want to get your hands on the ceramic brakes, you’ll need to pay extra. Inside, there’s not a lot to criticise about the RS6, just like there isn’t a lot to criticise about any Audi interior. The layout is – as always elegant, refinement is excellent and the air suspension does a good job of smoothing over the worst lumps and bumps. Design-wise, the RS6 looks crisp and simple, and the quality of the materials used is very high. The driver is set down low in a supportive and deep seat, and the sweeping dashboard feels very driver focused. Everything feels robust too and as though it’s a car that will stand up well to any test the average family on the road can throw at it. If you pay extra for the Performance Pack, you’ll also benefit from a few more goodies, such as cruise control and heated seats. Is the Audi RS6 Avant practical? It’s pretty much just as usable as the standard A6, although there’s a little bit less headroom here. Otherwise, you get all five seats, a large glovebox, a few cubbies here and there and some decent-sized door bins. The boot, meanwhile, measures 565-litres if you keep the rear seats up but this can be increased to 1,680-litres by folding the rear seats. The electrically-operated tailgate will be a welcome feature for buyers as it makes loading your items that bit easier. Standard kit is good across the range, with all models getting the likes of 20” alloys, LED rear lights, a bespoke styling package, a flat-bottomed steering wheel, sat-nav, a choice of ten colours, a BOSE 14-speaker, 600-watt sound system, a digital radio, air conditioning and the brands Drive Select system. The list of optional extras is quite extensive, but if we were to recommend anything it would definitely be the ceramic brakes. In terms of safety, the RS6 Avant hasn’t yet been crash-tested by Euro NCAP, but its saloon sibling was awarded all five stars back in 2011. Its standard safety kit includes stability control, six airbags, adaptive cruise control, Active Lane Assist and Side Assist. Prices for the new car start out from £81,430 and rise to £88,345. If you prefer to lease, you can pick up a deal from around £1,113 + VAT per month. For more information on our leasing deals, check out our page here. In terms of its running costs, the RS6 unsurprisingly can’t match the A6 for frugality. It has a BiK rating of 37%, sits in the highest insurance group and costs £295 a year in road tax. As if all that wasn’t enough, it returns 29.4mpg economy. That said, those returns aren’t exactly awful for a car of this type and Audi has fitted it with cylinder-deactivation technology which helps to keep costs down. What we like about the RS6 Avant is that its 597bhp is concealed behind a rather benign exterior that hardly prepares you for the astounding power on offer. It’s based on the A6 Avant, so everyday usability is a given. The interior sparkles with class, which optional extras only add to. It’s expensive to buy, run, insure and tax. Audi claim it can return over 29mpg but there’ll be days when you return 15mpg economy. Easily the biggest disappointment is the lack of driver involvement. Let’s see how the car fares against its rivals in the comparison section of our 2018 Audi RS6 Avant review. 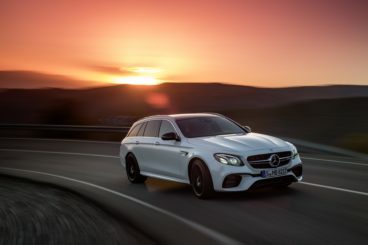 The new Mercedes AMG E63 Estate is just as muscular as the saloon variant, but despite being an Estate, it’s managed to be even more stylish. Like all AMG’s, this one is powered by an absolute monster of an engine. It’s a twin-turbocharged 4.0-litre V8 unit that develops 469bhp, and which can get you from rest to 62mph in a little over 4.0 seconds before maxing out at 155mph. Add the AMG Driver’s Package for a bit more cash, and you can change its max speed to 174mph. There’s also a C63 S model available that’s powered by a 503bhp variation of the engine, and which does 0-62 in 4.0 seconds flat. In contrast to the Audi and its Quattro system, the Mercedes feels more free and subsequently more involving. Its responsive steering will be exactly what buyers want as it gives you more confidence as you approach corners at speed. Traction control certainly helps as it keeps the car composed in poor conditions. Body lean, meanwhile, is kept to a minimum and the Estate is no worse to drive than the Saloon variant. Running costs? The AMG E63 Estate returns 34.5mpg at best and emits almost 200g/km of CO2. It has a BiK rating of 37% and costs £450 a year in road tax for the first five years. It also sits in the highest insurance bracket there is. Inside, the Mercedes is well-built and plush, but we’re not so sure buyers will be all that comfortable. The suspension is too much on the firm side, and while it reduces body lean it does a less decent job of smoothing out broken roads. Ride quality is not fantastic. Insulation is good, however, and very little external noises creep into the cabin. Other than that, there are plenty of gadgets to play around with, including the brands COMAND online infotainment system that comes with 3D mapping, wi-fi and a digital radio. Is the Mercedes AMG E63 Estate practical? It’s just as spacious as the saloon variant but feels more useful. The steering column and front seats come with the option power-adjustment and installing this feature improves visibility. A standard reversing camera also helps to this end. Rear headroom is good but legroom back there might be a bit of an issue for taller adults. The boot is slightly bigger than the saloon and can offer as much as 1,510-litres when the rear seats have been folded down. The new Porsche Cayenne Turbo blends titanic performance with everyday usability. The perfect family car? It depends what your budget is as this doesn’t come cheap. It still seems odd to call a Porsche a family car but worry not, there was never a chance the brand was going to water things down despite arming the Cayenne with practical touches. Even its entry-level turbocharged 3.0-litre V6 engine develops as much as 335bhp. However, it’s the Cayenne Turbo that we’re taking a look at here, and it’s powered by a vast 4.0-litre V8 engine. Sharp-eyed enthusiasts will note that this replaces the bigger 4.8-litre engine, but despite being smaller the new engine can offer more performance. So while the car tips the scales at 2,175kg, it can get you from rest to 62mph in 3.9 seconds before maxing out at 177mph. On or off-road, the Cayenne measures up well. 4D chassis control helps it to stay composed in tougher conditions, while its on-road driving modes let you tweak the settings to suit your mood. In terms of handling, the Porsche is easily the best in this review, there’s hardly anybody lean and grip is phenomenal. Running costs? 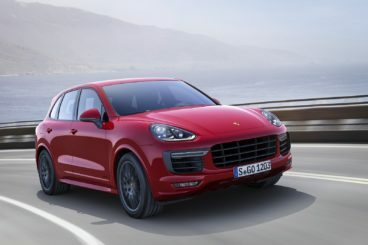 The Cayenne Turbo can’t return better than the 24.1mpg economy which does make it a very expensive car to run. It has a BiK rating of 37% and emits as much as 267g/km of CO2. It will also cost £450 a year in road tax for the first five years and we expect it to occupy the highest insurance group. Inside, the car is pleasingly refined and tyre and wind noise shouldn’t cause you much of an issue at all, even on the motorway. Ride quality is good thanks to air suspension, and families will enjoy the comfort on offer. The dashboard will be much more familiar to Porsche enthusiasts than past Cayenne dashboards and comes with a big, central rev counter. The driver is set down low, while a tall central tunnel just adds to the race car feel. Is the Porsche Cayenne Turbo practical? Its boot measures 741-litres and interior space should be more than satisfactory for most, if not all, buyers. The Turbo gets 18-way power-adjustable sports seats, the car is easy to manoeuvre in cramped city streets, while the reach bench is versatile and can slide backwards or forwards to increase leg or boot space. There aren’t that many cars that are as expensive as this one, which is why you need to be absolutely certain it ticks all the right boxes before buying. Essentially, it’s two cars rolled into one: It’s got the incredible power of a supercar and the practicality of an Estate. 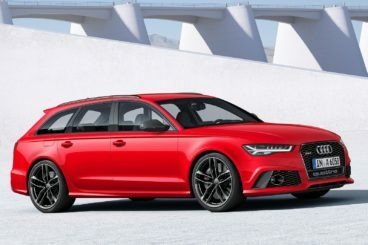 The Audi RS6 Avant is a monster – a two-headed one.